Welcome to the Customer Night Out Chicago Study, which offers Chicago local service businesses and startups a new way to increase profits. During the Customer Night Out study, CSRA focused its advanced analytics toolset on big spenders’ social media interactions about service businesses. We gathered the data, analyzed it and packaged it into reports with handy tables, charts and consulting advice. Reports show how to boost the results of social media, websites, email marketing and on-premises customer service. The study ran from April–May 2014. 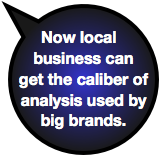 Now local businesses can compete on a level playing field for their customers’ attention. Experiential social media helps grow profits because it focuses on customers that pay the most: Business customers entertaining clients, customers taking out their friends and extended family members, and customers on romantic evenings. Sponsors of the Customer Night Out study got pre-study pricing as well as special use of its reports and recommendations. Although the study ran in 2014 and sponsorships are no longer available, CSRA can produce all the reports for any business, individually. Other than the sponsorship and timeline sections, the information here pertains to individual clients today. The General Report—paints a comprehensive picture of customer experience in three scenarios: customers on business, customers entertaining friends and extended family, and customers on romantic evenings. It describes trends and how service businesses impact customers’ evenings. The General Report is packed with hundreds of examples (data“) of services’ excellent and horrid service to their customers. You can click their links and see the original interactions. It filters the data and draws conclusions in its analysis. Its Recommendations give advice for how to use the insights to serve customers better, on-premises and online. Recommendations show how to use the insights to educate employees to react to these customers better, how to use the insight and data on your website and email marketing, and how to use social media. More on the General Report. Category Reports—drill down into how each service category impacts customers (i.e. bar, hotel, restaurant, salon..), so there can be eight Category Reports (only prepared when there’s a Silver, Gold or Plum). Each has much more detail on its type of service business, opportunities to improve experiences of big spenders, and comparisons among competitors. Keep in mind that customers are communicating online, but they are revealing services’ offline, on-premises operations, as well as their online operations (social media, web..). More on the Category Reports. Individual Reports—focus on one business, so they put an individual business under the microscope: its opportunities, how it compares to its competitors in customers’ eyes, and what it can do to compete better. More on Individual Reports. Interviews—take place early in the study. Sponsors share what they know about their customers on these three types of nights out, and they can specify things they would like to learn. When I’m conducting the data gathering, filtering and analysis, I take the interviews into account. Strategy Sessions—happen after the study is complete. They are collaborative sessions I hold with sponsors to help their teams understand reports and apply findings to their specific business. As the name suggests, Strategy Sessions’ main goal is creating plans to use the study’s findings to win more business from big spenders. Category Exclusivity—enables sponsors to restrict other sponsors in the same category from getting access to the valuable Category Reports and Individual Reports for three months after their sponsor dates. Given that the reports crack the code on these very special customers, Category Exclusivity gives sponsors a significant competitive advantage since they gain exclusive access to these reports, and three months is long enough for them to grab the lead. Reports are the “answer key” for business owners and general managers who want to earn more business from these special customers. Each kind of report has a different focus and emphasis, so they are complementary, and their value accumulates. The sponsorship model enables local services to afford the kind of research and advice that global brands have, and during “enrollment,” sponsors get big discounts on the reports and features. After the study, reports and features will be available to sponsors and any business at a substantially higher cost. Brands pay about $50,000 to use the Social Network Roadmap’s process in a one-to-one relationship with CSRA. Plum ($4,000)—Plum sponsors get the General Report, their Category Report, an Interview, Category Exclusivity, their Individual Report and a Strategy Session. Gold ($2,000)—Gold sponsors get the General Report, their Category Report, an Interview and Category Exclusivity. Silver ($1,000)—Silver sponsors get the General Report and the Category Report for their service. Bronze ($500)—Bronze sponsors get the General Report. 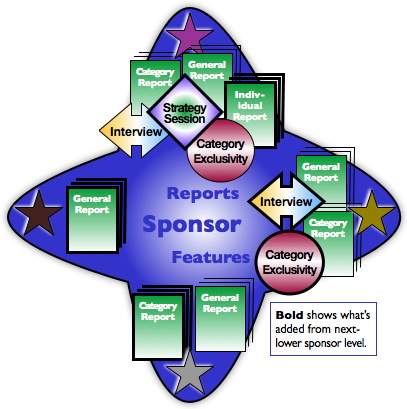 The graphic, right, shows how Reports and Special Features map to sponsorships. Plum sponsors get all reports and features. All sponsors get the General Report. Category Exclusivity bears special mention because it can affect all sponsors within a category. If your category has a Gold or Plum sponsor, you are limited to sponsoring Bronze because they block you from getting the other reports and features. However, timing takes precedence: if you sponsor Silver in your category, a Plum or Gold in your category who commits after you only prevents sponsors after their sponsor date, not before, so you get your category report, too! Get the full rundown here. Get Started gives you the tools to secure your sponsorship, while Learn More has even more detail about the study’s reports and special features.